Though the written vowels and accents came into use only c. 750 CE, the oral tradition they reflect is many centuries older, with ancient roots. Although not in common use today, the Tiberian pronunciation of Hebrew is considered by textual scholars[which?] to be the most accurate reproduction of the original Semitic consonantal and vowel sounds of ancient Hebrew. Today's Hebrew grammar books do not teach the Tiberian Hebrew that was described by the early grammarians. The prevailing view is that of David Qimchi's system of dividing the graphic signs into "short" and "long" vowels. The values assigned to the Tiberian vowel signs reveals a Sephardi tradition of pronunciation (the dual quality of qames (אָ) as /a/, /o/; the pronunciation of simple sheva (אְ) as /ɛ̆/). 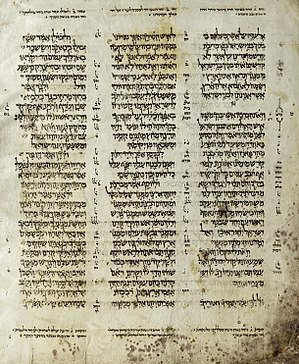 The Aleppo Codex of the Hebrew Bible and ancient manuscripts of the Tanakh cited in the margins of early codices, all which preserve direct evidence in a graphic manner of the application of vocalization rules such as the widespread use of chateph vowels where one would expect simple sheva, thus clarifying the color of the vowel pronounced under certain circumstances. Most prominent are the use of chateph chireq in five words under a consonant that follows a guttural vocalized with regular chireq (as described by Israel Yeivin) as well as the anomalous use of the raphe sign over letters that do not belong to בגדכפ"ת or א"ה. The explicit statements found in grammars of the 10th and 11th centuries, including the Sefer haQoloth ספר הקולות of Moshe ben Asher (published by N. Allony); the Sefer Dikdukei ha-Te'amim (ספר דקדוקי הטעמים Grammar or Analysis of the Accents) of Aaron ben Moses ben Asher; the anonymous works entitled Horayath haQoré הורית הקורא (G. Khan and Ilan Eldar attribute it to the Karaite Abu Alfaraj Harun); the Treatise on the Schwa (published by Kurt Levy from a Genizah fragment in 1936), and Ma'amar haschewa מאמר השוא (published from Genizah material by Allony); the works of medieval Sephardi grammarians including Abraham Ibn Ezra and Judah ben David Hayyuj. In the last two, it is evident that the chain of transmission is breaking down or that their interpretations are influenced by local tradition. Ancient manuscripts that preserve similar dialects of Hebrew or Palestinian Aramaic but are vocalized in Tiberian signs in a "vulgar" manner and so reveal a phonetic spelling rather than a phonemic spelling. These include the so-called "pseudo-Ben Naphtali" or "Palestinian-Sephardi" vocalized manuscripts, which generally conform to the rules enumerated below, such as pronouncing sheva as /ĭ/ before consonantal yod, as in /bĭji/ בְּיִ. Other traditions such as the vocalization of the Land of Israel and (to a lesser extent) the Babylonian vocalization. Each community (Palestinian, Tiberian, Babylonian) developed systems of notation for pronunciation in each dialect, some of which are common among the traditions. Transcriptions of Biblical text into Arabic characters and then vocalized with Tiberian signs (by members of the Karaite community); they provide an aid to pronouncing Tiberian Hebrew, especially for syllable structure and vowel length (which is marked in Arabic by matres lectionis and the sign sukun). Various oral traditions, especially that of Yemenite Hebrew pronunciation and the Karaite tradition; both have preserved old features that correspond to Tiberian tradition, such as the pronunciation of schwa according to its proximity to gutturals or yod. Tiberian Hebrew has 29 consonantal phonemes, represented by 22 letters. The sin dot distinguishes between the two values of ש, with a dot on the left (שׂ) being pronounced the same as the letter Samekh. The letters בגדכפת (begadkefat) had two values each: plosive and fricative. Waw ו conjunctive was read, before the labial vowels (בומ״ף) and shva (אְ), as אוּ /ʔu/, rather than וֻ /wu/ (as is the case in some eastern reading traditions). b) The "peculiar" resh [r] before or after Lamed or Nun, any of the three being vocalized with simple sheva and Resh after Zayin ז, Daleth ד, Samekh ס, Sin שׂ, Taw ת, Tzadi צ, Teth ט, any of them punctuated with simple sheva: יִשְׂרָאֵל [jisrɔˈʔel], עָרְלָה [ʕɔrˈlɔ]. Because of the proximity of a dental consonant, it is likely that Resh was then pronounced as an alveolar trill, as it still is in Sephardi Hebrew. c) There is still another pronunciation, affected by the addition of a dagesh in the Resh in certain words in the Bible, which indicates it was doubled [ʀː]: הַרְּאִיתֶם [haʀːĭʔiˈθɛm]. As can be seen, this pronunciation has to do with the progressive increase in length of this consonant (הָרְאִיתֶם). It was preserved only by the population of Ma'azya (מעזיה), which is in Tiberias. This vowel chart gives a general idea of the vowel space of Tiberian Hebrew. It is not meant to be a precise mapping of the tongue positions, which would be impossible to do anyway since there are no native speakers of Tiberian Hebrew. The Tiberian tradition possesses three reduced (ultrashort, hatuf) vowels /ă ɔ̆ ɛ̆/ of which /ɛ̆/ has questionable phonemicity. [nb 3] /ă/, under a non-guttural letter, was pronounced as an ultrashort copy of the following vowel before a guttural (וּבָקְעָה [uvɔqɔ̆ˈʕɔ]) and as [ĭ] preceding /j/, (תְדַמְּיוּנִי [θăðammĭˈjuni]). However, it was always pronounced as [ă] under gutturals: חֲיִי [ħăˈji]. As described above, vowel length was dependent on syllable structure. Open syllables must take long or ultrashort vowels; stressed closed syllables take long vowels; unstressed closed syllables take short vowels. Traditional Hebrew philology considers ultrashort vowels not to be syllable nuclei. The simple sheva sign changes its pronunciation depending on its position in the word (mobile/vocal or quiescent/zero), as well as due to its proximity to certain consonants. In the examples given below, it has been preferred to show one found precisely in the Bible which represents each phenomenon in a graphic manner (i.e. a chateph vowel), although these rules still apply when there is only simple sheva (depending on the manuscript or edition used). At the beginning of a word. This includes the sheva (originally the first of the word) following the attached particles bi-,ki-,li- and u- and preceded by metheg (the vertical line placed to the left of the vowel sign, which stands for either secondary stress, or its lengthening). Examples: וּזֲהַב /ˌʔuzăˈhav/ Genesis 2:12; בִּסֲבָךְ /ˈbisăvɔx/ Psalms 74:5. But is not pronounced if there is no metheg; that is, they form a closed syllable. The sheva following these three vowels /e/, /ɔ/, /o/, except for known types of closed syllables (and preceded or not, by metheg). Examples: נֵלֲכָה-נָּא /ˌnelăxɔˈnːɔ/ Exodus 3:18; אֵלֲכָה נָּא /ˈʔelăxɔ ˈnːɔ/ Exodus 4:18. The second of two adjacent shevas, when both appear under different consonants. Examples: אֶכְתֲּבֶנּוּ /ʔɛxtăˈvɛnːu/ Jeremiah 31:33; וָאֶשְׁקֲלָה-לֹּו /wɔʔɛʃqălɔˈlːo/ Jeremiah 32:9 (except for at the end of a word, אָמַרְתְּ /ʔɔˈmart/). The sheva under the first of two identical consonants, preceded by metheg. Examples: בְּחַצֲצֹן /băˌћasˤăˈsˤon/ Gen. 14:7; צָלֲלוּ /sˤɔlăˈlu/ Exodus: 15:10. The sheva under a consonant with dagesh forte or lene. Examples: סֻבֳּלוֹ /subɔ̆ˈlo/ Isaiah 9:3; אֶשְׁתֳּלֶנּוּ /ʔɛʃtăˈlɛnːu/ Ezekiel 17:23. The sheva under a consonant which expects gemination, but is not marked thus, for example, the one found under ר. And sometimes even מ when preceded by the article. Examples: מְבָרֲכֶיךָ /măvɔʀăˈxɛxɔ/ Genesis 12:3; הַמֲדַבְּרִים /hamăðabăˈʀim/ 2 Chronicles 33:18. In case a quiescent sheva was followed either by a guttural or yodh, it would turn into mobile according to the rules given below, if preceded by a metheg. Ancient manuscripts support this view. Examples: נִבֳהָל /nivɔ̆ˈhɔl/ Proverbs 28:22; שִׁבֲעַת /ʃivăˈʕaθ/ Job 1:3. Any sheva with the sign metheg attached to it, would change an ultrashort vowel to a short, or normal length vowel. For this, only ancient, reliable manuscripts can give us a clear picture, since, with time, later vocalizers added to the number of methegs found in the Bible. It would change its sound to imitate that of the following guttural. וּקֳהָת /ˌʔuqɔ̆ˈhɔθ/ Numbers 3:17; וְנִזְרֳעָה /wănizrɔ̆ˈʕɔ/ Numbers 5:28. It must be said that, even though there are no special signs apart /ɛ̆/, /ă/, /ɔ̆/ to denote the full range of furtive vowels, these remaining four (/u/, /i/, /e/, /o/) are represented by simple sheva (ḥaṭaf ḥiriq (אְִ) in the Aleppo Codex is a scribal oddity, and certainly not regular in Hebrew manuscripts with Tiberian vocalization). All other cases should be treated as zero vowel (quiescent, nah), including the double final sheva (double initial sheva does not exist in this Hebrew dialect), and the sheva in the words שְׁתַּיִם /ˈʃtajim/ and שְׁנַיִם /ˈʃnajim/, read by the Tiberian Masoretes as אֶשְׁתַּיִם /ʔɛʃˈtajim/ and אֶשְׁנַיִם /ʔɛʃˈnajim/ respectively. This last case has similarities with phenomena occurring in the Samaritan pronunciation and the Phoenician language. Depending on the school of pronunciation (and relying on musical grounds, perhaps), the metheg sign served to change some closed syllables into open ones, and therefore, changing the vowel from short to long, and the quiescent sheva, into a mobile one. The names of the vowels are mostly taken from the form and action of the mouth in producing the various sounds, as פַּתַ֫ח opening; צֵרֵ֫י a wide parting (of the mouth), (also שֶׁ֫בֶר) breaking, parting (cf. the Arab, kasr); חִ֫ירֶק (also חִרֶק) narrow opening; ח֫וֹלֶם closing, according to others fullness, i.e. of the mouth (also מְלֹא פּוּם fullness of the mouth). קָ֫מֶץ also denotes a slighter, as שׁוּרֶק and קִבּוּץ (also קבוץ פּוּם) a firmer, compression or contraction of the mouth. Segôl (סְגוֹל bunch of grapes) takes its name from its form. So שָׁלֹשׁ נְקֻדּוֹת (three points) is another name for Qibbúṣ. Moreover the names were mostly so formed (but only later), that the sound of each vowel is heard in the first syllable (קָמֶץ for קֹמֶץ, פַּתַח for פֶּתַח, צֵרִי for צְרִי); in order to carry this out consistently some even write Sägôl, Qomeṣ-ḥatûf, Qûbbûṣ. ^ In fact, all stressed vowels were first lengthened in pause, see Janssens (1982:58–59), as can be seen by forms like Tiberian כַּף /kaf/ < */kaf/, pausal כָּף /kɔf/ < */kɔːf/ < */kaːf/ < */kaf/. The shift in Tiberian Hebrew of */aː/ > */ɔː/ occurred after that lengthening but before the loss of phonemicity of length (since words like ירחם with allophonically long [aː] show no such shift). ^ That is attested to by the testimony of Rabbi Joseph Qimḥi (12th century) and by medieval Arabic transcriptions: Janssens (1982:54–56). There is also possible evidence from the cantillation marks' behaviour and Babylonian pataḥ: Blau (2010:82). ^ These two rules, as well as the rule that metheg changes sheva from an ultrashort to a normal vowel, are recorded by Solomon Almoli in his Halichot Sheva (Constantinople 1519), though he states that these differences are dying out and that in most places vocal sheva is pronounced like segol. In Oriental communities such as the Syrians, these rules continued to be recorded by grammarians into the 1900s (e.g. Sethon, Menasheh, Kelale Diqduq ha-qeriah, Aleppo 1914), though they were not normally reflected in actual pronunciation. The rules about yodh and metheg, though not the rule about gutturals, is still observed by the Spanish and Portuguese Jews of Amsterdam: Rodrigues Pereira, Martin, 'Hochmat Shelomoh. Bar-Asher, M. (1998). Scripta Hierosolymitana Volume XXXVII Studies in Mishnaic Hebrew. Dotan, A. (1967). The Diqduqe Hatte'amim of Aharon ben Moshe ben Asher. Eldar, I. (1994). The Art of Correct Reading of the Bible. Ginsburg, C.D. (1897). Introduction to the Massoretico-Critical Edition of the Hebrew Bible. Golomb, D. M. (1987). Working with no Data: Semitic and Egyptian Studies presented to Thomas O. Lambdin. Hayyim, Z. B. (1954). Studies in the Traditions of the Hebrew Language. Malone, Joseph L. (1993). Tiberian Hebrew phonology. Winona Lake, IN: Eisenbrauns.